Thermal modification for housed livestock and poultry production (HLPP) systems has evolved from outside raised or uncontrolled naturally ventilated building systems into sophisticated computer-controlled cloud-analyzed complexes in the quest for producing a safe, reliable, sustainable, and efficient protein supply for our ever-growing population. This chapter discusses a few of the various HLPP systems used in the USA and details the design process in quantifying the needs for our housed livestock and poultry. Specific emphasis is placed on general building characteristics, general ventilation design features, heat stress control, and systems designed to address animal welfare. This is a chapter from Hoff, S.J. 2018. 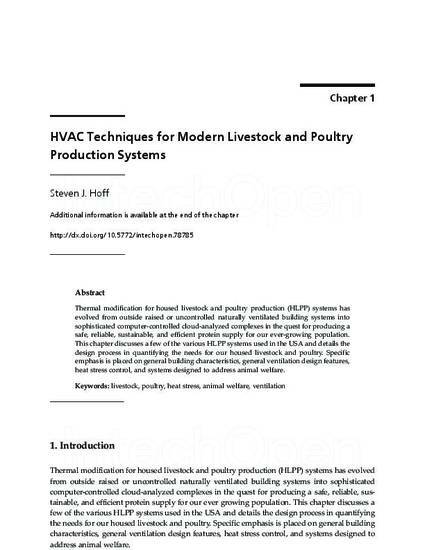 "HVAC techniques for modern livestock and poultry production systems." In: HVAC System, Mohsen Sheikholeslami Kandelousi, editor, Intechopen, doi: 10.5772/intechopen.78785. Posted with permission.